Alumnus Ralph Korte earned a bachelor’s in business from the SIUE School of Business in 1968. The founder of The Korte Company built his construction firm into one of the nation’s top 100 Design-Build firms, according to Engineering News and Record. The Korte Company is celebrating Ralph’s inspiring career with this video. Korte has been actively involved in the School of Business for years and is a member of the School’s Alumni Hall of Fame. He chaired the School’s advisory board for many years and was instrumental in establishing the construction management degree program. In the late 1990s, Ralph and his wife, Donna, contributed funding to create the first smart classroom that is named for them in the School of Business. In the early 2000s, Ralph made an endowed gift of $1 million for the purpose of funding education innovation. “Ralph has been the School of Business’ best public advocate for many years, often attributing the growth of his company to the fundamental management skills he learned at SIUE,” said Tim Schoenecker, interim dean of the School. With Ralph’s input in 2009, The Korte Company did the architectural plans and design for the Cougar Business Resource Center, which is used by students for group and team meetings, presentation practice, simulations, and as office space for student organizations. Ralph Korte Stadium is home to the Cougars’ men’s and women’s soccer teams, and men’s and women’s track and field programs. Korte’s impact has been felt across campus as he has provided in-kind project management for various initiatives. 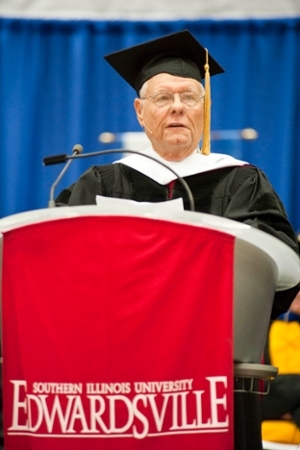 Photo: Ralph Korte addresses the Class of 2010 at commencement.